Summary: In the final version of my Windows PowerShell WMI helper module, I add aliases and modify comment-based help to find roles of functions. Microsoft Scripting Guy Ed Wilson here. It is the weekend, at least in Charlotte, North Carolina, in the United States. I have had a lot of fun working on my WMI helper module this week, and the last thing I need to do is to add a few aliases, and add the function description attribute using a technique I recently came up with. Today, I am up to version 6 on my HSGWMIModule module. 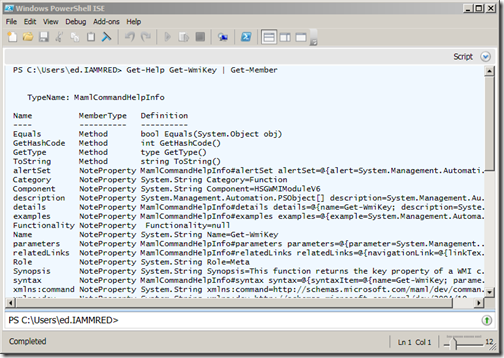 Note This is part six of a multipart article on developing a WMI helper module. On Monday, I created the base WMI module, and included a couple of really great functions that query the WMI schema and return WMI class methods and properties. On Tuesday, I added a function that returns the key property of a WMI class. 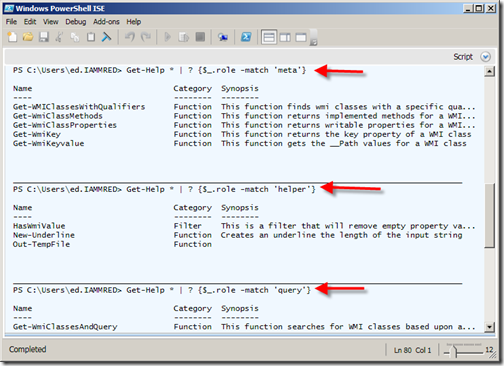 This is useful when working with WMI instance methods. On Wednesday, I created a function that will return the values of those key properties. On Thursday, I added a HasWMIValue filter to the module. Yesterday, I added two functions. 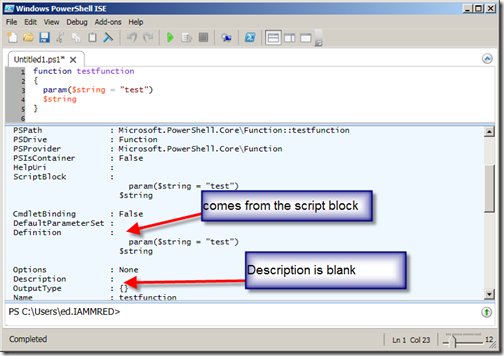 The first is a function that will query WMI classes using a wildcard character pattern. The second function is an Out-TempFile function that accepts piped input and displays results in a temporary text file in Notepad. 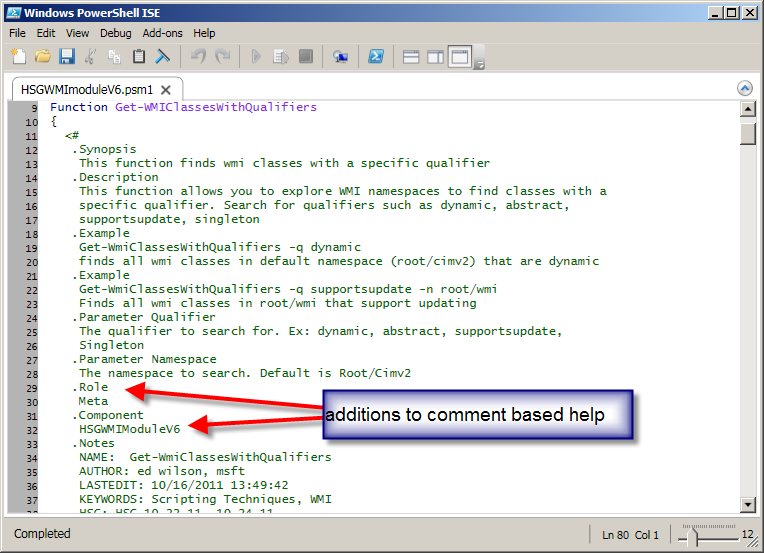 Another Note The version six of my HSGWMIModule is available on the Scripting Guys Script Repository. On May 28, 2011, I wrote a Hey, Scripting Guy! 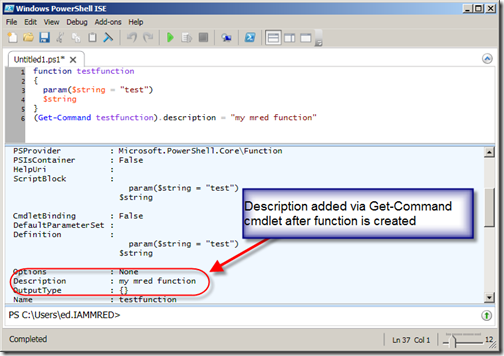 Blog post called Learn How to Use Description Attributes in PowerShell Functions in which I talked about using the rather finicky [system.compomentmodel.description] attribute. It does not play well with comment-based help, and it has a tendency to error out for no apparent reason. In that article, I also talk about finding functions that come from various modules, so the article is useful. On the other hand, I was not extremely happy with the solution. I was playing around looking at the members of a function, and I noticed something—there is a description property; the same property exists for variables, aliases, and other things. The description property of a function appears in the following figure. In the following figure, I create a function, and then assign a description to it. Once I have done that, I use the Get-Item cmdlet and pipe the results to the Format-List to display the newly added description. One thing that makes it easier to add the aliases and the function descriptions is to load the HSGWMImoduleV5 via the Import-Module cmdlet into the Windows PowerShell ISE. This simple action permits me to take advantage of tab expansion, which is a good thing given the length of some of the WMI function names. However, the long names also take advantage of one of my Windows PowerShell best practices of using a descriptive name for the function and shortening the name with an alias. Now I import my newly revised HSGWMImoduleV6. I decided to use two fields in comment-based help that are not used by any cmdlets. I found these by examining the results from Get-Help by piping it to Get-Member. This command is shown in the following figure. The commands and associated output are shown in the following figure. I placed these beneath the parameter section and above the notes section. This is shown in the following figure. That’s it for my WMI Helper module. I have uploaded version 6 to the Scripting Guys Script Repository. If there are other things you would like to see in my module, let me know via email at scripter@microsoft.com. WMI Week will continue tomorrow when I will talk about an easy way to use WMI association classes.